I missed the theater run and waited patiently. I watched other movies and read other books. I let it seemingly fade from my mind, but always I was waiting. 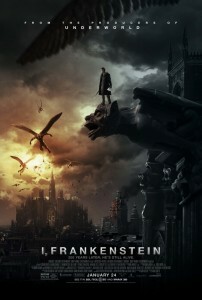 Finally, streaming via Netflix I, Frankenstein. When I had first heard of the movie I asked many questions about the creature and his story. Would it adhere to much of what was laid down in the original Frankenstein by Mary Shelley? To be fair I should point out that the movie itself is based on a graphic novel by Kevin Grevioux, who created an entire universe where Victor Frankenstein’s creature becomes a dark hero in modern times. With that understanding some details and elements have been altered as one might expect. The creature is attacked by demons while burying his maker in the Frankenstein family cemetery. After taking out one of the demons and being subdued by two others he is then rescued by gargoyles and taken to their stronghold. There the creature is assessed by the gargoyle queen. It is she who looks into his eyes and sees something worth preserving. She gives him the name Adam and allows him to go his own way. Two hundred years later Adam is drawn back into the war between the gargoyles and demons. Now the advancement of science allows for the earnest exploration of reanimation. The written record of Victor Frankenstein’s work and the walking, talking proof of his success would be invaluable in this endeavor. The demons have a vested interest in the successful application of the reanimation process, and where demons take interest there can be no hope for good intentions. In watching the movie, as with any movie I watch, first I allow myself to get caught up in the story as is. On that note I thoroughly enjoyed it. It has all the hallmarks of the movies I love best when appeasing my dark muse. It speaks of the world in the shadows, that which bubbles below the surface, where the war between good and evil rages. It also blends in some elements of science fiction that particularly delight my sense of intrigue when I think about how Grevioux holds a degree in Microbiology. As to how it answered my questions I found the answers interesting and acceptable if I pretend that Shelley’s account was a fictionalized telling of a real tale. The movie’s Adam does not demonstrate the soliloquous monologuing of the creature in Shelley’s novel. Rather, Adam embodies the enduring rage of being rejected and betrayed by his maker whose death did not provide closure. He has endured purposeless, surviving without enriching his life with meaning, believing it had none. This is not the creature who stated his intent to end his existence. This is Adam, a being who clings to life for no other reason than that it is the only thing he has. This is a being searching for answers to the same questions we all ask: Who am I? Why am I here? What is my purpose? However, I have to say that for two hundred years his search seems to have been on hold or only passively pursued. It isn’t until the existence of Victor Frankenstein’s journal is revealed to him that he truly begins to actively wrestle with these questions once again. Ultimately he determines his own answers, as do we all, and in so doing he also seems to embrace the name Frankenstein. The creature that has no name is often referred to erroneously as Frankenstein, so it is interesting that here he takes it for himself. There are two instances of dialogue in the movie discussing his name, the first being when the gargoyle queen names him Adam, but there is another where he is addressed as Frankenstein and some explanation for this is offered. A name can be an important signifier. The name we are called by others is merely a title until we own it. What we call ourselves declares our identity. So when the creature owns the name Frankenstein, what is he declaring? The movie makes it clear, but I think back to the creature in Mary Shelley’s novel and wonder…would he own the name Frankenstein?